ideo footage of the new version of the Google Android music app has leaked, revealing a revamped and colorful user interface. The updated app is much easy on the eyes that its predecessor. The vibrant colors of the album covers captured our attention, while the elegant transitions and album stacking strike us as being more like the iPhone’s iPod music player. It’s more readable as well. 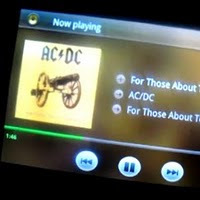 You’ll see the new music application launch with Android 3.0, aka Honeycomb. The Android interface has long needed an upgrade to keep it competitive with the design of the iPhone UI. We’ve heard that Android 3.0 will bring much-needed graphical and usability updates to the OS. The leaked music app is likely a preview of what we can expect.